Why don’t elephants get cancer? Evidently they have multiple copies of the tumour suppressor gene p53. You have to wonder about medical research sometimes. Why certain studies are selected over others. How potential research studies are graded A+ over others. This science attributes absence of the big C in the largest land mammal to possession of multiple copies of the tumour suppressor gene p53. I remember hearing about the discovery of p53, and oncogenes such as ras and myc in the early 80s. This new knowledge of genetics would have cancer beaten within 5 years!! Fast forward around 30 years and how much further forward are we? Still researching p53 evidently. Now in elephants…What do we know about elephants? What are the unanswered questions about elephants? I love Jumbos but there is so much we don’t know about them. For instance – How do you get four elephants in a mini? 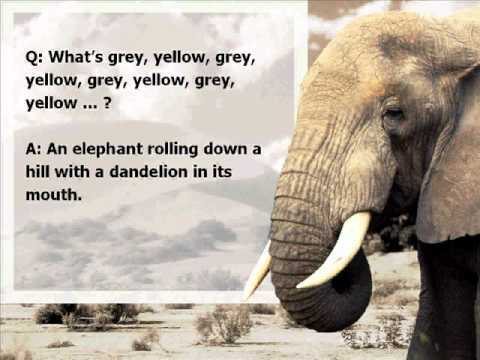 Or – why do elephants wear shoes with yellow soles? I’m sorry – I am being rather facetious….. But seriously – do these researchers think the answer is that simple. It seems to me that elephants have very few risk factors for developing cancer apart from their mass. Do we see elephants on street corners smoking cigars, eating Pringles, glugging strong liquor, ingesting McDonalds? Answer – no, we do not. Just possessing a gene for something or other does not necessarily mean it will be expressed automatically. These findings are exciting and open up possibilities for study in the decades ahead. But unfortunately this new research is of little practical help to patients today.